As a professional, you send your ideas into the world in writing—via books, blogs, articles, and more. In today’s crowded marketplace, the more you write, the more every word counts. Who can help you break through the clutter? Editors: your conduit to communicating to those you want to influence. For if an experienced editor doesn’t “get” your message, neither will they. And because the written word sticks around longer than the spoken word, it matters! You grow as a writer. Pay attention to editors’ changes and learn the tricks of the editing trade. That includes getting assurance that your piece meets your objective. You improve your book’s marketing power. A good editor can wordsmith titles, headings and subheads as well as incorporate keywords to hook readers during online searches. You gain insight and save embarrassment. Your writing benefits from an editor’s initial “deep massage” that asks insightful questions and makes suggestions to hone your message. 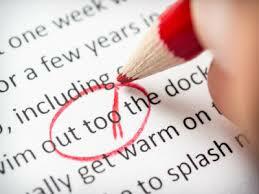 It’s followed by a tight copyedit to find those pesky grammar gremlins and wording errors before readers do. After you make changes, your editor reviews everything, does a final proofread, and keeps your project moving. For books, the magic of selecting the right editor lies in the Sample Edit—a complimentary edit of your work from your manuscript. Sure, you get value from seeing Before and After of someone else’s project, but don’t skip this step. Request samples from all contenders. That’s how you come close to comparing apples to apples. if the edits changed your voice—a huge concern for authors. And it does something else: The Sample Edit helps determine your project’s place on the editing spectrum. Does it require proofreading, copyediting, or a complete rewrite? Along with word count, that determines an editor’s customized fee, communicated in writing up front. In your selection process, be sure to examine prospective editors’ credentials. Study their websites and peruse their portfolios. Testimonials are great, but also ask for references so you can pose questions to their clients related to your needs. In short, don’t miss the opportunity to deliver your best writing. After all, it’s you, your voice, your contribution to the world. Make sure your message comes across clear and strong. It’s that important! Active: “The boy chomped into the juicy watermelon.” The verb “chomped” is active. Passive: “The juicy watermelon was eaten by the boy.” The word “by” is a clue that it’s passive. No more than 21 words in a sentence. Word Alert: The word “that” doesn’t substitute for “who” when referring to a person. You’d refer to someone who speaks, not someone that speaks. Use the correct word to say what you mean. Even from excellent writers, editors often encounter misused words: browse vs. peruse, compliment vs. complement, advice vs. advise. As an expert editor, Barbara McNichol proudly helps speakers/authors change the world with their well-crafted words. Over 24 years, Barbara has placed more than 350 books (and counting) on her editor’s “trophy shelf.” She is also the creator of Word Trippers Tips, a resource for better writing available at www.WordTrippers.com.